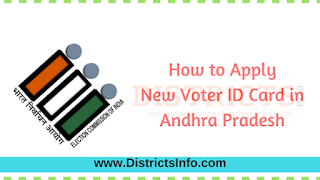 How to Apply for New Voter ID Card in Andhra Pradesh, Voter id Offline and Online: Offline and Online Process to Obtain Voter ID Cards in Andhra Pradesh. Election Commission of India issues voter ID card to all the citizens who completed 18 years of age. This is one of the important identity cards and the required document to cast vote in elections. This can also be used as an identity card for many purposes including for obtaining a SIM card. All the citizens who competed for 18 years of age can get voter ID card in Andhra Pradesh. Non-resident Indians also can obtain voter ID if they do not have the citizenship of any other country. A person can only get registered as a voter in one place. The persons who want to get their voter ID must submit Form – 6 which needs to be submitted to Electoral Registration Officer in their assembly constituency. Persons who want to get enrolled as voters in Andhra Pradesh can also submit their applications online. For this, it is needed to log in into http://ceoandhra.nic.in/home.aspx. The site, apart from registering new Voters also provides many other services such as checking voter ID card status, correction of Voter ID, checking Andhra Pradesh voter lists and know the details of upcoming elections and election officers. To register as voters in Andhra Pradesh State, visit the above-mentioned site and go to the home page. Locate the e-registration button and click it. You will be shown the list of voter registration forms such as Form 6, Form 7, Form 8 and Form 8A. For new voter registrations, the form to be submitted is Form 6. Click on this and you will be shown the Form no. 6 to register as a voter in Andhra Pradesh state. Provide all the information asked and upload a passport size photograph. Check all the entered details carefully. At the end click submit button. Do not forget to note the unique voter ID card application ID. If you find it difficult to read and understand English you can take the help of Translate button and this will show the details in Telugu. After submitting Form 6 online, a booth level officer or BLO will visit the residence of the applicant to verify the identity. He will take the signature of the applicant on the printed Form 6 and will ask you to submit address proof, date of birth proof and age proof documents. You can check the status of your application also by visiting the official website. It is possible to get voter ID card in Andhra Pradesh in offline method also. For this, there is a need to download Form 6 from the official site or the application form will be available in the election officer. Fill in the details and submit it to the officer along with the required documents. Here we provide various related links of voter id. Now Apply for New Voter Id Card online in Andhra Pradesh, Apply for Voter ID Card Online Form 6. This procedure "Apply for New Voter ID Card in Andhra Pradesh" applicable for following districts East Godavari, West Godavari, Krishna, Guntur, Prakasam, Sri Potti Sri Ramulu Nellore, Srikakulam, Vizianagaram, and Visakhapatnam, Kurnool, Chittoor, YSR Kadapa, and Anantapur these districts of Andhra Pradesh state in India.